252 pages | 2 B/W Illus. Economic growth in Asia over the past half century has led to significant changes in societies, business organization and the nature of work. This has been accompanied by the rise in some countries of trade unions and also of employers’ associations. 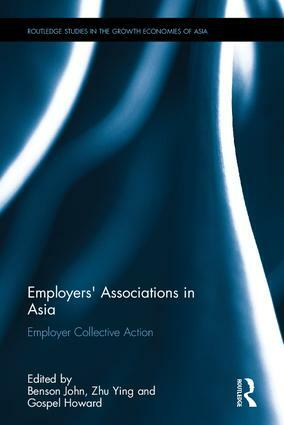 This book explores the nature of employers’ associations in the major countries of Asia. It considers how employers’ associations have developed in recent decades, how changes in market structures and the profile of economies have affected employers’ associations, how employers’ associations deal with issues to do with pay and employment conditions, and how they interact with regulation and the state. The book shows how the differing political and institutional contexts of different countries, and different economic conditions, greatly affect the nature of employers’ associations and also the wider context of labour markets and trade unions. John Benson is Professor and Head of the School of Business at Monash University Malaysia and an Adjunct Professor in the Department of Management, Monash Business School at Monash University Australia. Ying Zhu is Professor and Director of the Australian Centre for Asian Business at the University of South Australia. Howard Gospel is Professor of Management at King’s College, University of London, and also at the Libera Universita Internationale degli Studi Sociale in Rome.